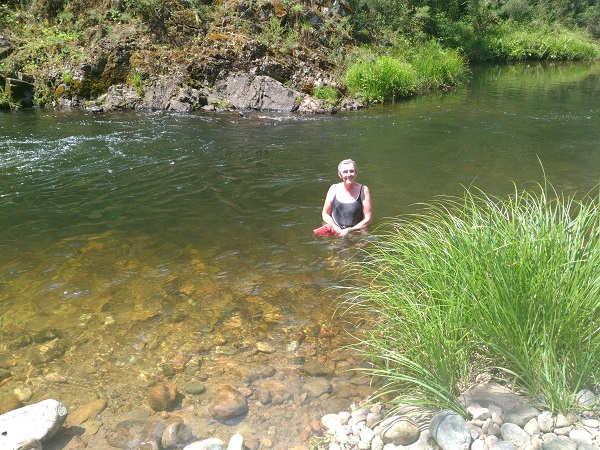 Worth the struggle through snake infested scrub, the best swimming hole in North East Vic. I found this spot about 15 years ago at the height of my trout fishing mania. The back corner would be three metres deep and I've pulled a couple of memorable fish out of it. Gorgeous @Zoffiel .... pics of the trout would be good, please! @Sarnicad It is most extrordinarily beautiful, the sort of beauty that is almost hard to believe. It looks stunning! Would have liked a pic with Chickie in your t-shirt!! I agree with her about the March flies. Took one of the kids to a music lesson in Kew (very wealthy Melbourne suburb) today. 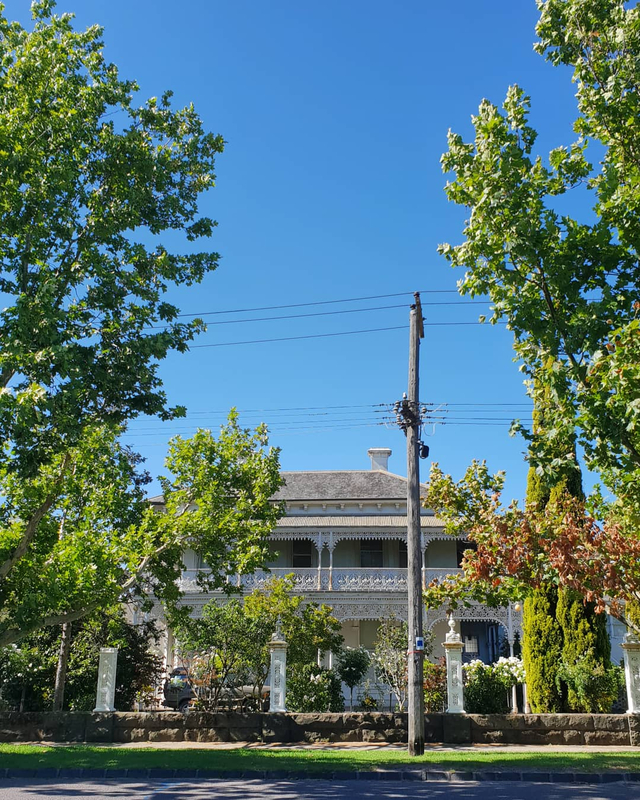 I used the hour to go for a walk and gawp at the posh houses. Wow, are there some beauties round there! Not sure what this is called, but they cone up every January in a small area on our Nannup property. Look like a flower made of feathers. Summer is the season the Red-tailed Black Cockatoos lose their tail feathers. This is from a male (solid colours). The female feathers are mottled and stripy. Found two on my walks over the week. We 've got rain! The Kimberley is wet - well my bit of it. Now this is in no way intended to rub it in to those of you still waiting for rain in drought stricken areas, however we have waited 12 months for a decent downpour. We will no longer be going "troppo". The heavens opened at 08:00 am and in 21 minutes my wirelessly read rain gauge says 32 mm. ( I am technically up there with the best of them). The solar panels will be getting a wash, the ground is wet, the garden will be happy and the shallow aquifer will be replenished. Our water will be sweet once again. It was getting a bit "chewy" over the past few months! There is 2 inches of water over the lawns and running down the driveway. The big green tree frogs are doing naughty things on the lawn. All is good with the day. The newcomers to town will be predicting that the road out of town ( The Derby -Broome Highway) will be closed, that the Fitzroy River will be OVER the bridge at Willare and we had better do some "buy up big" shopping at Woolies just in case. We who know better will just say "is that right". I have never seen water over the Willare Bridge. The decking is 17.5 metres above the river bed. I have seen the water a metre below the bridge decking. Water pouring out of the gutters - we don't bother with downpipes. This is 10 minutes worth of rain. That's my orchid house. I think we can now turn off the reticulated misters! The driveway is now a bit squishy. I will be up to my ankles in mud at the gate! I think I will leave walking out to my sewing room ( 50 metres from the house) until the thunder and lightening has passed. I'm a scaredy cat. However within 24 hours evidence of rain will be negligible. 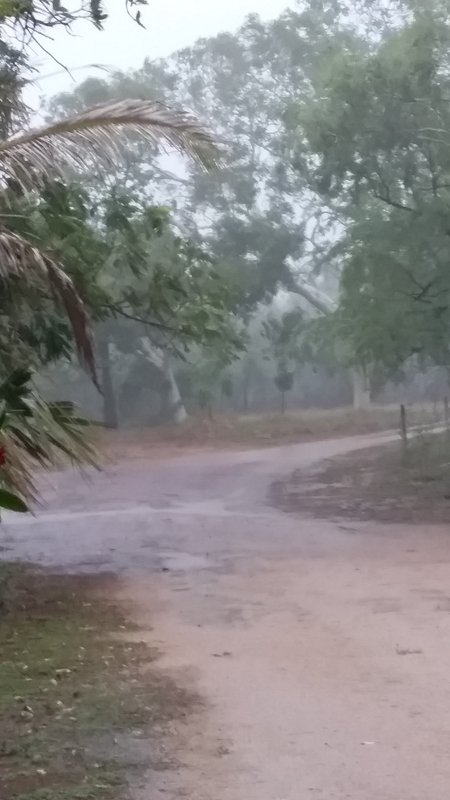 Such is life in the Kimberley in the wet season. WOOHOOO! I saw on the BOM that there was the chance of rain up your way @Annie C ! That is just brilliant!! Do you have big tanks as well, to collect the rain - tho without downpipes - maybe you are on town water? Stay safe - I hope you've got enough food to last you, just in case the road is cut! The flower is Mulla Mulla. There are many varieties and the colours range from pale pink to dark purple. 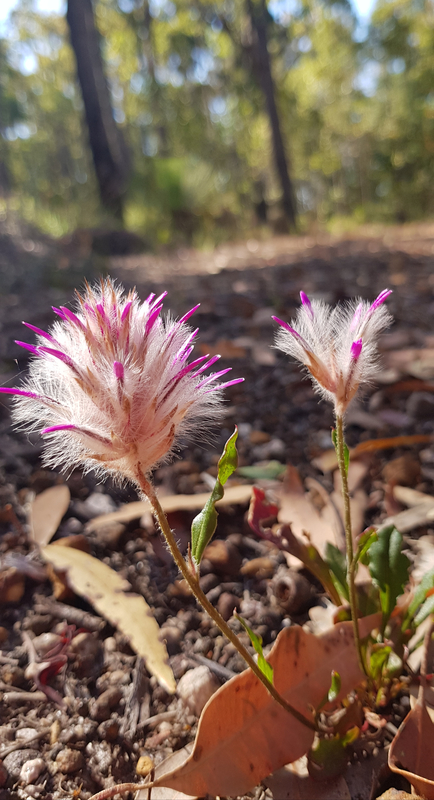 Along the roadsides in the Kimberley you will see round pink pompom like flowers of Mulla Mulla that we call Bachelor Buttons. No we are not on town water. The Water Corporation say 10kms out of town is too far to bring a big pipe! Has advantages though as we do not pay water rates or water consumption. We don't use tanks to collect rainwater. Too much dust on our roofs that collects in the other dry 10 months. Our water is from a bore. Come September / October the bore water is "tasty"! I never buy up big. I am however fond of saying that we could live out of our store cupboard for 6 weeks. Same with the freezer. A generator comes in handy when the power goes out, as it often does. Especially when the personnel in the gas fired powerhouse in town miscalculate on the number of gas tankers required! We are connected to unreliable town power. Hence a generator. Last year the road was cut for 18 days, and you know what, we managed. The only person who could not understand why I could not make the appointment with the oncologist was the clinic receptionist! She did not quite understand that a closed road is a closed road and that there was no other way to get to the airport 220 kms away! I offered a Jacarandah School Atlas! She did not know what that was either. 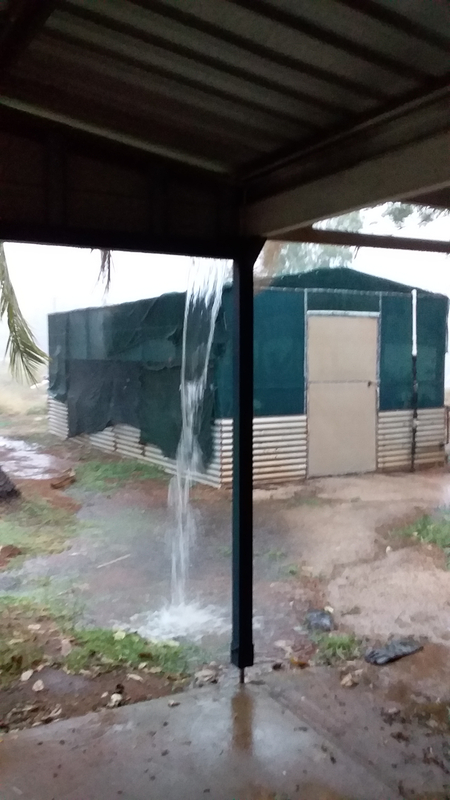 Ah life in a Kimberley Wet Season. OMG! @Annie C I can't believe she didn't understand what a Closed Road was - specially living in WA!! We even have closed roads from floods here, cutting us off from the highway now & then, with flooding!